As with the myriad aspects of Odin, each with its own set of attributes, Freya is portrayed in many different guises in the mythology. In the Völuspá version, she is unbreakable, as elemental and powerful as gold and magic. As we come through the medieval period and into early modern times, she merges into the folk tale figure of Frau Holle. 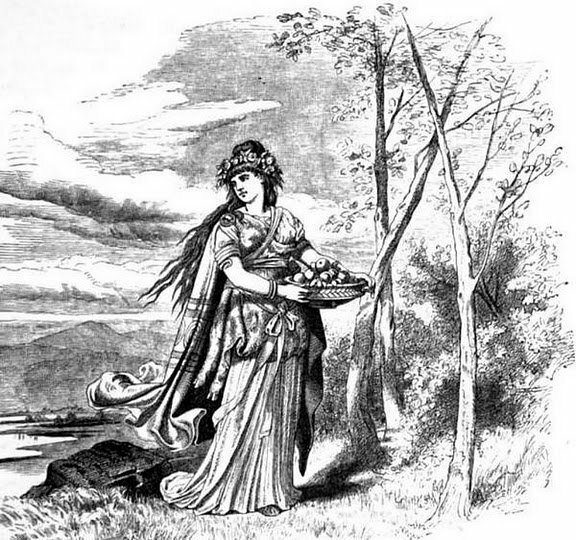 In Wagner's Rhinegold, his character Freia is sometimes referred to by the name Holda; the composer is conflating two goddesses. The name of the goddess Holda comes from the Gothic word Hold ("favor" or "grace"). She was a goddess of the Suebi tribe and was, according to Jacob Grimm, a "kind, benignant, merciful goddess or lady." Holda survived into the age of folk and fairy tales, and was still present in local German traditions in the 19th century as Frau Holda, Hulde, Holle, Hulle, and Holl. She is a kindly figure who lives in the sky and is helpful to humanity; she is only upset "when she notices disorder in household affairs." 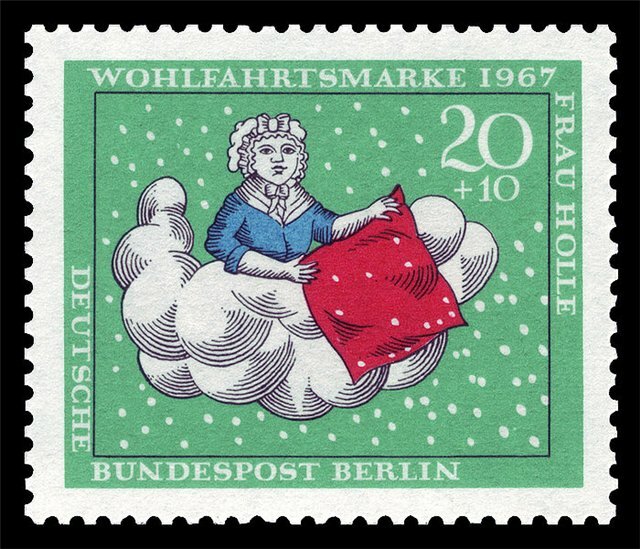 During the winters of my childhood, my father told me of the German folk tradition that, when Frau Holle made her bed in the sky, she would shake out her comforter, and the downy feathers would fall to the earth as snow. The earlier goddess Holda, like Freya and the Germanic earth goddess Nerthus, drives in a wagon or cart. There are darker, probably earlier aspects to her character; she is as complicated and multifaceted as the other gods of the Norse pantheon. Like Odin, she rides the storm as part of the Raging Host – a role that lines up with the role of Freya as a sort of super-valkyrie. Holda appears in a 14th century Icelandic saga as a prophetess or wise woman named Huldr, and she is mentioned as a beloved of Odin and mother by him to the half-goddesses Thorgerđr and Irpa. As we will see in a moment, several versions of the female goddess – as Freya, Holda, and other forms – have points of connection through their relationship to Odin. All of these goddesses can be seen as aspects of a larger, more all-encompassing female divinity. Freya is also connected with another goddess, Idunn ("rejuvenator"). 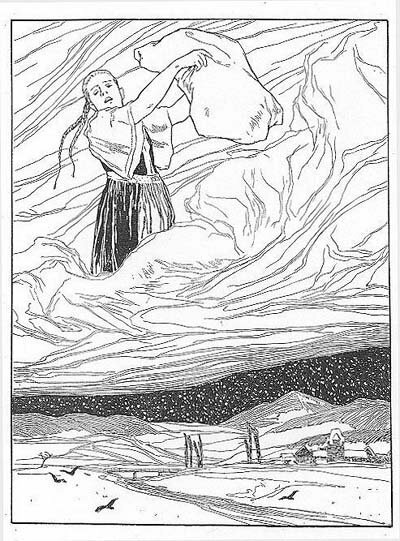 In the Norse myths, Idunn, like Freya, is lusted after by giants. In the Norwegian poem Haustlöng ("autumn-long"), composed at the turn of the 10th century, Loki helps the giant Thjazi steal away the goddess and her mystic apples. The gods are kept forever young and strong by the power of these apples, and they quickly begin to feel the effects of age in their absence. They compel Loki to make good for his tricks, so he transforms himself into a falcon (with the aid of Freya’s magic cloak), sneaks into the giant’s home, transforms the captive goddess into a nut, and carries her back to the gods. 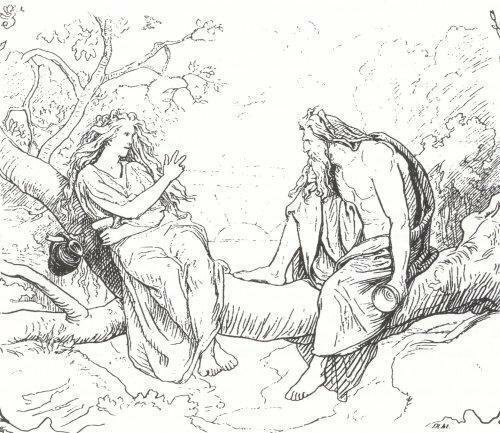 Like Thor's wife Sif, Idunn seems to be a harvest or spring goddess who only survives in the mythological corpus through, basically, a single tale. Like Sif, she may have once been a more all-encompassing Earth goddess, or she may have been one aspect of Freya or some other, more complex female figure. A more important figure connected to Freya is Frigg, the wife of Odin and the queen of the gods. If we go back far enough in time, it is possible that Freya and Frigg were originally the same figure, but somehow split into separate characters at some point. For a mythological conception of godhood where individual gods have so many, often contradictory aspects, it is not hard to imagine that, over time, certain aspects could split off into a wholly separate figure. That being said, Freya (meaning "woman") and Frigg (meaning "lady") may have been originally identical. As mentioned previously, Freya weeps tears of gold for her missing husband, and she herself travels the world in search of him. His name is Ód ("frenzy"), seemingly the same name as Odin, which translates the same; both names derive from the Germanic wüten ("to rage"). The name changed as it moved North, dropping the w in Wodan to form Odin; here the ending has also dropped off to form Ód. In the few surviving texts that mention the Ód figure, he is travelling the worlds as a wanderer – perhaps the Wanderer (with a capital W) aspect of Odin himself reduced to a character with only that one attribute. Freya has a special relationship with Odin that is very understandable when we realize that she parallels Frigg, his wife. Odin sends his thoughts out in the form of ravens, and Freya puts on a cloak of falcon feathers to soar through the skies. Odin sits on Hliðskjálf and sends his ravens out into the world, as the seid prophetesses mentioned earlier make their mystic statements while sitting on high seats; clearly, there is a connection between Odin and the female figures based on shamanistic practice. Notably, Freya's hall in the godly realm is known as Sessrumnir ("seat-room"), a name that can be easily connected to the high seat of the prophetess. 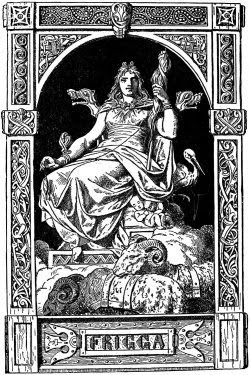 Freya also has connections to the wisdom-seeking aspect of Odin. 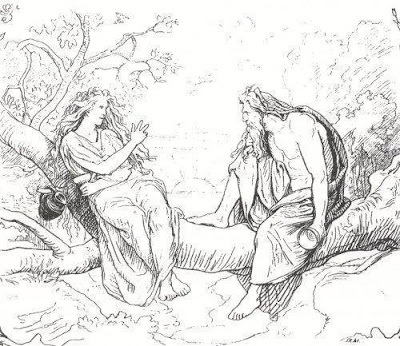 Like him, she engages in wisdom contests with mystical figures, as in the Eddic poem Hyndluljóð ("song of Hyndla"), in which she verbally spars with the giantess and prophetess named Hyndla.